Designed for easy integration in the supply chain of companies involved in logistics, manufacturing, warehousing and distribution, and in-store retail. The Falcon 345 is the latest member of the growing family of feature-rich Falcon Industrial Data Collection Terminals from Datalogic. Engineered for fast accurate customizable real-time automatic data collection to solve the needs of businesses in their quest for greater efficiency productivity and profitability. 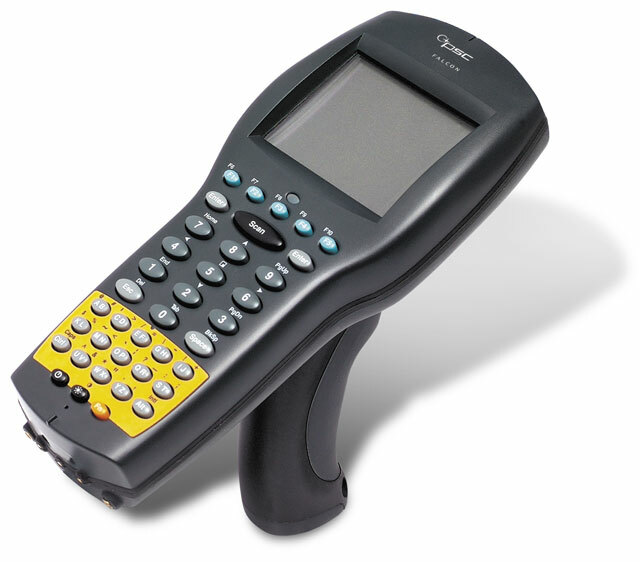 The Falcon 345 was designed for easy integration in the supply chain systems of companies involved in logistics manufacturing retailing warehousing and distribution. At the heart of the Falcon 345 Portable Data Terminal is a powerful 32 bit 486 class processor running at 33MHz with 8MB of RAM and 2MB of Flash ROM. This flexible architecture also supports an internal PCMCIA Type II PC card for additional memory or wireless LAN connectivity. Because the Falcon 345 use a standard operating system DOS 6.22 you can run applications previously developed for other Falcon terminals and other DOS terminals. You can also use popular PC development tools like Datalogic's Universal Program Generator (UPG) or RF SDK to create custom applications for your data collection needs. The Datalogic 345-1101-025 is also known as Data Logic	PSC-F3451101025	or 3451101025	.